Didn't quite make it. ALMOST made it. Very very close. In fact, I was sitting in the lounge waiting to be boarded when two Mexicana employees approached. Short version ... "The heater in the cargo hold is not working. We cannot fly your dog to Mexico City." So, again, short story, here we sit for another night. Mexicana cannot guarantee they will be able to fly Habibi tomorrow. They will not make a commitment until the plane gets here at noon and they double check the cargo hold. Did you realize once you are through security on an international flight, you are 'out of your country of origin'? That means you must fill out declaration customs forms to get back into Canada, go through immigration and customs, collect your bags, have them screened and inspected. They inspect your dog, even though he just left five minutes ago and ask for his papers. It took 1 1/2 hours for re-entry. Even though I never left the airport, it was a very long day. I changed a few things in my luggage. Put a bag of 'heavy stuff' in another suitcase and checked it through to make my carry on a little lighter. The 'heavy stuff' included my toothbrush, hairspray, and other items which might assist a girl in looking her best. I may arrive home looking like a waif. It's raining. Habibi has to go potty. Habibi has to go potty outside. My hair is already flat and I figure it's only going to go down hill from here. Does the spa at the hotel sell hair spray, you ask? No. I called. The only shop where I could get such things is a 15 minute walk to the other end of the airport. My body is already aching from the workout today. Is it worth it? Perhaps in the morning. Tonight, there is a huge jetted tub with baths salts which is calling my name. Have any of you been through Vancouver Air Port? Are you familiar with Bill Reids' work. He was a sculpter. His huge work 'Spirit of Haidi Guaii' is a prominent part of this building. The original is in the Canadian Embassy in Washington, DC. It takes my breath away. Absolutely stunning, spectacular, awe inspiring and mysterious. I can 'feel' it. It moves me. In my mind, I'm in the canoe with them on their voyage. I thought you might be interested. Here we are at last, a long way from Haida Gwaii, not too sure where we are or where we’re going, still squabbling and vying for position in the boat, but somehow managing to appear to be heading in some direction; at least the paddles are together, and the man in the middle seems to have some vision of what is to come. As for the rest, they are superficially more or less what they always were, symbols of another time when the Haidas, all ten thousand of them, knew they were the greatest of all nations. The Bear, as he sits in the bow of the boat, broad back deflecting any unfamiliar, novel or interesting sensation, eyes firmly and forever fixed on the past, tries to believe that things are still as they were. The Bear Mother, being human, is looking over his shoulder into the future, concerned more with her children than with her legend. After all, they wandered in from another myth, the one about Good Bear and Bad Bear and how they changed, so she has to keep a sharp eye on them. Next, doughtily paddling away, hardworking if not very imaginative, the compulsory Canadian content, big teeth and scaly tail, perfectly designed for cutting down trees and damming rivers. And here she is, still the ranking woman of noble birth, yielding no place to the pretty Bear Mother. In spite of her great cheeks like monstrous scars, her headdress reflecting the pointed shape of the dogfish head, and her grotesque labret – in spite of all these, the most desirable and fascinating woman from myth-time. More magical than the Mouse Woman, as mysterious as the deep ocean waters which support the sleek, sinuous fish from whom she derives her power, Dogfish Woman stands aloof from the rest, the enormous concentration of her thoughts smouldering smoke dreams behind her inward-looking eyes. Tucked away in the stern of the boat, still ruled by the same obsession to stay concealed in the night shadows and lightless caves and other pockets of darkness, in which she spends her immortality, the Mouse Woman lost her place among the other characters of her own myth, an important part of the Bear Mother story, and barely squeezed in at the opposite end of the boat, under the tail of the Raven. No human, beast or monster has yet seen her in the flesh, so she may or may not look like this. Not so the Raven. There is no doubt what he looks like in this myth-image: exactly the same as he does in his multiple existences as the familiar carrion bird of the northern latitude of the earth. Of course he is the steersman. So, although the boat appears to be heading in a purposeful direction, it can arrive anywhere the Raven’s whim dictates. A culture will be remembered for its warriors, artists, heroes and heroines of all callings, but in order to survive it needs survivors. And here is our professional survivor, the Ancient Reluctant Conscript, present if seldom noticed in all the turbulent histories of men on earth. When our latter-day kings and captains have joined their forebears, he will still be carrying on, stoically obeying orders and performing the tasks allotted to him. But only up to a point. It is also he who finally says, “Enough!” And after the rulers have disappeared into the morass of their own excesses, it is he who builds on the rubble and once more gets the whole thing going. The Wolf of the Haidas was a completely imaginary creature, perhaps existing over there on the mainland, but never seen on Haida Gwaii. Nevertheless, he was an important figure in the crest hierarchy. Troublesome, volatile, ferociously playful, he can usually be found with his sharp fangs embedded in someone’s anatomy. Here he is vigorously chewing on the Eagle’s wing while that proud, imperial, somewhat pompous bird retaliates by attacking the Bear’s paws. That accounts for everybody except the Frog who sits partially in and partially out of the boat and above the gunwales: the ever-present intermediary between two of the worlds of the Haidas, the land the sea. So there is certainly no lack of activity in our little boat, but is there any purpose? Is the tall figure who may or may not be the Spirit of Haida Gwaii leading us, for we are all in the same boat, to a sheltered beach beyond the rim of the world as he seems to be, or is he lost in a dream of his own dreamings? The boat moves on, forever anchored in the same place. 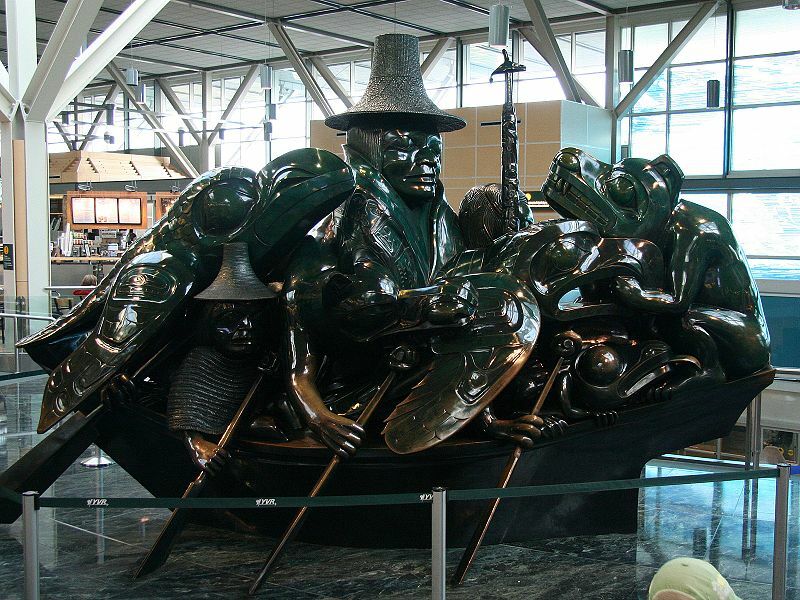 The Spirit of Haida Gwaii: The Jade Canoe by Bill Reid. Collection of the Vancouver Airport Authority (YVR), Vancouver, Canada. Photo: Bill McLennan. © Copyright 2008 Bill Reid Foundation.